It’s true what your granny told you: fish is good brain food! It’s packed with all those essentials that help the brain function properly. It’s easy to cook and is best served simply which makes it ideal for the days the kids want to help make dinner. Grease a foil-lined baking tray. Lay the salmon fillets on it. Put a dab of butter on each, season with salt and pepper and squeeze the lemon juice over. Bake them for 7-8 minutes until cooked. Salmon is best cooked slightly under-done rather than over-done. Fresh tuna is easily available these days and is very simple to cook as well as being highly nutritious. If you haven’t tried it, do! Its taste is unrecognisable from canned tuna. Make the dressing by mixing the ingredients together and leave to stand for 30 minutes.Mix together the tomatoes, olives, beans and dressing. Spread foil over the grill rack and brush with oil. Lay the tuna steaks on the foil and sprinkle with the mixed herbs and salt. Grill at a medium heat for about 3 minutes on each side or until cooked. Like steak, tuna is best served medium-rare. 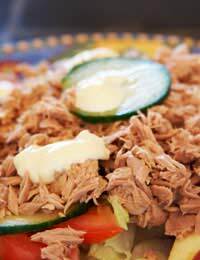 Serve the tuna with the salad, all sprinkled with finely-chopped chives. Tinned tuna is a handy standby to keep in the house. Mix it with mayonnaise for sandwiches, serve as it is with salad, or let the kids make this simple straight-from-the-pantry tuna casserole. Preheat the oven to 170oC, gas mark 3. Cook the macaroni as directed on the packet. When cooked, mix it with the drained tuna and the soup. Pour it all into a casserole dish and top with grated cheese. Cook for 30 minutes. Make sure it is hot through and bubbling before serving. Summer means barbecues and what better to cook than fresh fish? Served with crusty French bread to mop up the juices, barbecued mackerel is full of flavour and goodness. Brush some large sheets of foil – large enough to make a package around the mackerel. Make three deep cuts in each side of the fish. Brush both sides with oil and sprinkle with salt, pepper and lemon juice. You might like to put a slice of lemon in the body cavity of the fish, or a sprig of thyme or tarragon. Seal the foil package and cook the fish on the barbecue for about 4-6 minutes a side depending on size, until cooked. Serve in its package so the juices are retained.